I know this is going to sound crazy to many of you, but I leave some weeds in my garden on purpose. This wasn't always the case. When I was growing up on the farm, we had a huge garden for fresh eating and preserving. With long, straight rows of veggies and paths in between each row, weeding was a never ending chore. My stepdad used to run the tiller up and down the paths, while the rows themselves were tediously weeded by hand. Inevitably by the end of the season, weeds that escaped the hoe would be overgrown and seeding out, to be tilled into the soil and start the whole cycle again. I dreamed of a garden without weeds. Fast forward to the 90's, and my very own garden beds to arrange any way I wanted. I discovered the magic of mulch and planting in blocks instead of rows with nekked empty space between. Instead of dirt paths that turned to dust when things got dry and mud when it got wet, I had raised beds with tidy paths between, perfect for a suburban yard. Weeds – Guardians of the Soil? Then things changed again. Attached to the end of another article a friend had copied off for me was a page of another manuscript – “Weeds: Guardians of the Soil“. It caught my eye, but I had no idea where to read more as the book was no longer in print, and the friend passed away. Then I ended up doing a review of the book, “Building Soils Naturally“, and the author referred me to the online reprint of the weed guardian book. Around this same time I met a lovely lady by the name of Candy, who started teaching me about using weeds for medicine, and got started talking with another dear family friend about using weeds for food. All of this changed the way I garden forever. Since I've started learning about permaculture, I've discovered even more uses for wild plants and “garden volunteers”. Now, I'm not talking about letting weeds completely overrun everything. I am talking about putting weeds to work in the garden instead of despising them. Let's get started! What if I told you that I had a variety of “super spinach” that didn't bolt in the summer heat, was 4% protein and had over 300 mg of calcium per serving compared to 88g for Swiss chard 93g for regular spinach? How about another salad green that has 300-400 mg of omega 3 fatty acids per cup, and seven times more beta carotene than carrots? Best of all, both of them might be volunteering for free right in your garden. Sounds great, right? The two weeds mentioned about are lambsquarters and purslane, both featured in the Weekly Weeder series. In the book, “The Wild Wisdom of Weeds: 13 Essential Plants for Human Survival“, Katrina Blair includes these weeks plus eleven more on her list of some the most nutrient dense, widely available wild plants on the planet. They're generally mild in flavor, easy to identify, and food that will not only help you to “survive” but thrive. Nature abhors a vacuum. If you don't plant something on open ground, something will plant itself, and that's a good thing, because otherwise we'd be losing more topsoil than we already are. Weed seeds are stunningly persistent in the soil. Many of them stay viable for decades. (I wish my garden seeds would last so long in storage.) They want to grow, so I let them grow – I just pick and choose the ones that are a little easier to manage in the space that I'm working in. I've tried planting planned ground covers in my garden, but with our short season and my crazy-quilt style of garden planting (I mix and match plants and companion plants to keep the bugs confused), I normally miss my window of opportunity for getting groundcovers planted at the correct time. Enter the self-planting groundcover – AKA weeds. I clear the area where I'm putting in seeds or transplants, let them get well established, and then let the open space fill in with appropriate weeds. I got this idea from “Weeds: Guardians of the Soil”, where the author talked about how the corn growing with purslane covering the ground around it did better than the corn that had the purslane removed. Sweet corn patch after a late summer storm. Corn was around 7 feet tall (trellis to left is around 6 feet). Ground between corn rows is covered mostly with purslane and lambsquarters. Purple flowers at front are sweet alyssum, for additional beneficial insect habitat. Last year in my corn patch, after the corn got established, I allowed the purslane and lambsquarters to fill in between the rows. For the first time, when we got hit with a nasty wind storm as the corn was close to ripening, the wind didn't knock the corn over. What About a Three Sisters Style Planting? People have asked, “Couldn't you have done something similar with more useful plants, like a Three Sisters planting of corn, beans and squash?” Yes, I could have tried this, but I think that particular arrangement works best when you have dent or flint corn paired with shell beans and winter squash, where everything ripens at the end of the season together. That way you don't need to step on the beans and squash to harvest the sweet corn. I tried the arrangement once with sweet corn and pole beans and ended up strangling the corn. It was a mess and nothing did well. 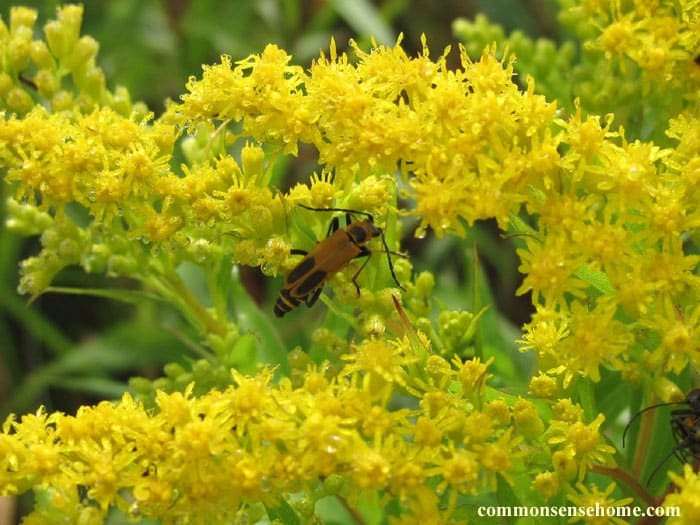 This soldier beetle feeds on goldenrod pollen. Their larva are predators that eat problem insects. This is one of the first things I noticed when I started paying attention to weeds – they're just as alive with activity as intentionally planted flowers. A bee doesn't care weather a flower is planted or wild. Other beneficial insects such as lady bugs, tachnid flies, hoverflies, parasitic wasps and lacewings use wild plants for food and shelter. Weeds also provide pollen and nectar for our pollinators early and late in the season. Another aspect you might not think of is that weeds act as food for problem bugs. This may sound like a bad thing – BUT – think of them as “bait”. If I have some aphids munching on my weeds, who cares? There are plenty of weeds, and they're tough. These aphids provide a nice buffet for the for the beneficial insects that eat them. If for some reason my regular garden crops get stressed and the aphids decide to nibble on them, too, then the insects that eat the aphids will be on hand to keep them under control. Without the insects they dine on (the prey), beneficial insects won't stay in the area to be ready when you need them. In a healthy garden, there will always be bugs. They're a part of a healthy ecosystem. If plants are healthy and vigorously growing, a little nibble here and there won't be a problem. If plants are stressed, that's when you have serious damage and destruction. It's all about balance. This year I had another “ah hah!” moment as I was reading Gaia's Garden. It turns out those weeds I was letting grow for the bees and for groundcover were also building the soil. Gaia's Garden has a section titled, “The Pieces of the Ecological Garden: Plants for Many Uses”, and in that section is a three page chart listing plants that are “dynamic nutrient accumulators”. This means that these plants shoot roots deep into the ground and pull up nutrients that they accumulate in their leaves. When they loose their foliage in the fall, the nutrients build up in the topsoil – instant fertilizer. On this list were over 20 plants that frequently show up as weeds or “volunteers” (planted once and growing every year since) in my garden. These plants accumulate nutrients such as nitrogen, potassium, phosphorous, copper, calcium, magnesium and zinc. (Each plant tends to accumulate one or more specific nutrients.) It should be noted that they may also accumulate heavy metals such as lead, so be cautious if you think there may have been lead paint or other contamination of the soil. Weed Tea Fertilizer to the Rescue! For roughly each pound of fresh weeds, add 8 cups of water into a container with a lid, such as a bucket. Allow to sit outside for about two to four weeks (longer in colder weather). About once a week, stir well. Hold yer nose, 'cause fermenting weeds can be quite smelly. Do not touch this concentrated liquid fertilizer with your hands! Wear gloves. This concentrate will stain, and is difficult to remove from skin and clothing. Don't wait too long to use your liquid fertilizer. After a time, the green brew will begin to change color to grey, brown, black and maybe even white. When it has changed color, it has been too decomposed to use as high powered fertilizer, but it will make an excellent addition to the compost pile. For a quick, small and less stinky small batch option, you can boil some weeds on the stove top with enough water to cover, allow to cool, strain and apply to plants, composting the weed solids. Purslane acts as a ground cover and soil builder around the cucumber plants. 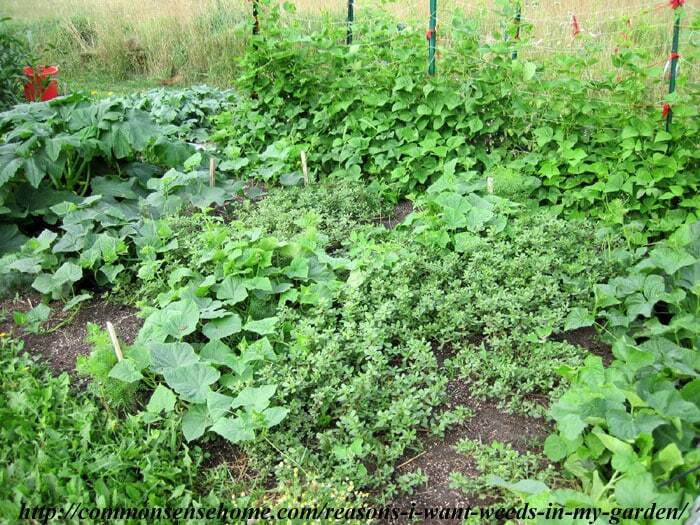 As the cucumber plants grow, they spread right over the top of the purslane. Have a bee sting? Put some medicine leaf on it. Seasonal allergies? How about a natural decongestant? Upset stomach? How about a soothing mint tea? Wild plants can be all these things and more. 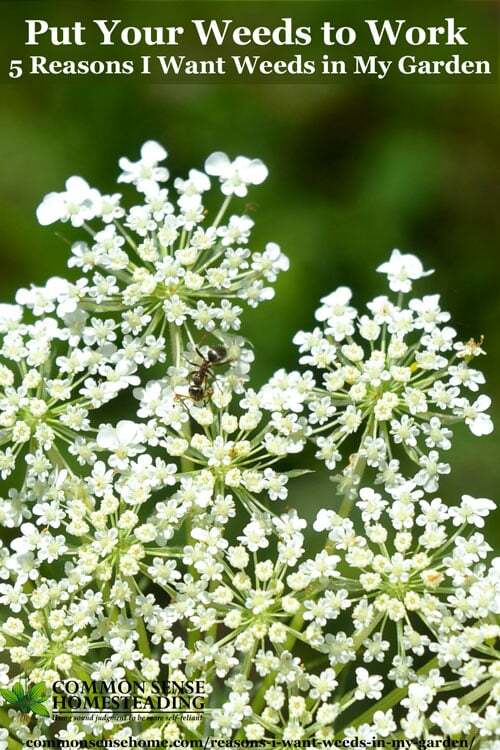 Almost all of the 40+ plants featured in the Weekly Weeder series have been used as medicine. Many of the plants we now label “weeds” were carefully brought by earlier settlers of an area to be used as food and medicine because there was no modern pharmacy. Almost all care was self-care. We've lost many of these old ways, but there's a small and growing movement to relearn the proper use of plant medicine. I include some basics of plant medicine in the Weekly Weeder posts. Other great resources are The Herbarium and other herbal training from the Herbal Academy. The Herbarium is a listing of plants and their uses (monographs), complete with printable charts and graphs. If you're new to the idea of plant medicine, poke around the Weekly Weeder series and get an idea of what they can do. If you'd like to learn more, take a look around the Herbal Academy website. There you can connect with a team of formally trained herbalists who can help you every step of the way as you learn to use the medicines you can grow in your own backyard. I am an Herbal Academy affiliate, so if at some point you choose to purchase one of their programs through my link, I earn an affiliate payment at no extra cost to you. You won't be disappointed. They're good people. I hope this post has encouraged you to look at weeds not just as pests, but as a potentially valuable resource in your garden. You can use a scuffle hoe to nip the little ones off as they come up to protect new planted garden seedlings, and manage the larger plants by harvesting for food, medicine or compost/plant food. 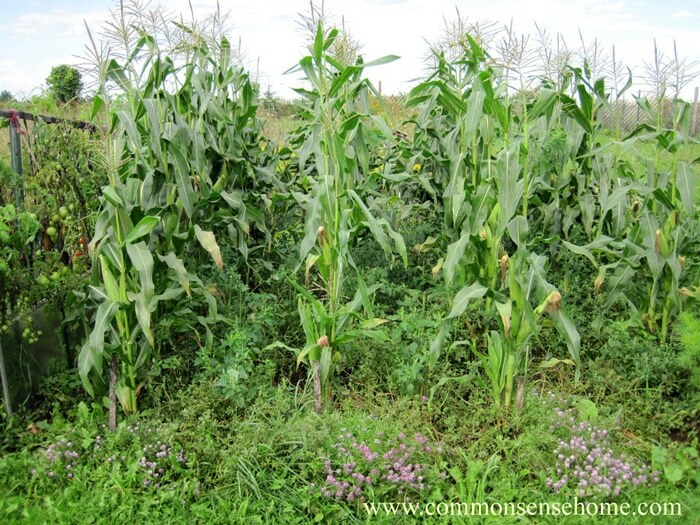 I also have several tips for non-toxic weed control in this post. If you pick the weeds before they seed out, it will help keep the little weedlings from going too crazy. Just like in life, it's all about balance and making the best of what you have. Are you a wild plant person? What's your favorite way to put weeds to use in your garden? I'd love to hear from you and have you share this post on social media to get the word out. We need to stop poisoning ourselves and our gardens just to get rid of “weeds”. Thank you, Ilene. I know this post isn’t likely to get much online “buzz”, but I hope at least some people take a look and realize that we shouldn’t be using toxic chemicals to wipe out plants that can be so useful. Mountain Rose Herbs sells many seeds for plants that are considered weeds by some, such as plantain. Alternatively, you can look around and collect seed heads from plants you like. A third option is to simply till the soil, and any weed seeds that are there that have the right conditions to grow will grow. Weed seeds can lay dormant in the soil for decades, just waiting for the right opportunity. They are survivors. So- what do you think about cedar bark mulch around your plants? 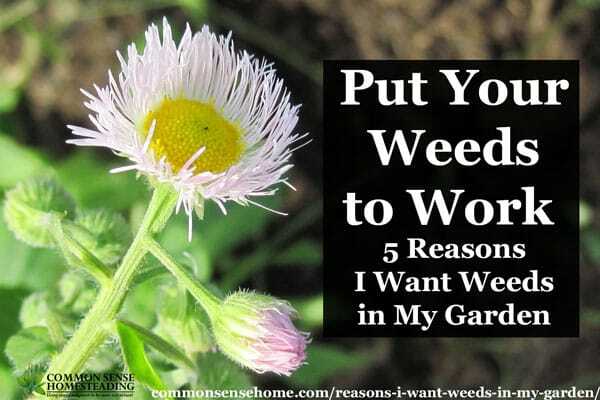 I hate to weed and when we do our garden it gets weeded about the first month of the summer before I am done weeding- so I love the idea that they are good for your garden! But we are trying mulching around our tomatoes this year since we are in a severe drought part of the country. Thanks for the article and all the links! In general I’m a big fan of mulch – either living or non-living – as bare ground is just bad for the soil ecosystem. Bark mulch directly in the garden beds can be a little difficult to work with, as it can tie up nutrients as it breaks down. If you use it on the surface, it’s not such a big deal, but if you end up working it into the soil (while cultivating), it can really tie up nitrogen. Just make sure your plants are well fed and it shouldn’t be an issue (and is a much better option than naked ground). The lambsquarters spanakopita looks delicious! And don’t you love “Gaia’s Garden”? I posted about it on my new blog recently as well, because it is a wonderful book. I have now renewed it about 4 times as it’s a library book and I can’t bear to part with it yet! Yes, I did really enjoy that book. We put in a huge tree and shrub order for this season to expand our permanent plantings, with an eye to building stable permaculture guilds. I was so excited to learn that the herbs that i let wander around the garden like catnip, yarrow and lemon balm help build the soil, because we’ll be able to take starts and transplant them along with the new plantings. Free plants are the best! Love your post very insightful. I am in the midst of setting up a garden. It a new adventure for me, I was a bit daunting at first but I have taken my time and been learning heaps. Nice to work with them. Been deciding to plant some herbs amongst the beds. So much to learn but I just love it. Love this article! Currently the only weed I grow is nettles. I use them in the compost bin as an accelerator, make a nettle tea to use as fertilizer, a milder tea to drink, sometimes use as mulch and of course eat them. I look forward to trying some of the things you suggest in my little garden. I enjoy learning to harvest and use the plants around me. We add 8 or so ‘weeds’ to our salad and make Parsley dressing from my over abundant parsley supply. I have been harvesting and making Plaintain salve for years for use on cuts, bruises, and insect bites. In the summer I have plant substance hanging in my kitchen to dry and make tea in the winter. My boys are great at harvesting plants for eating when hiking. Nothing better than going into the yard to pick my food. This year I learned how to harvest the seed from Pigweed or Hopi Red Amaranth. I will have a field of it next year! Great post!! I grew up in Ohio and my parents had a business where we made and sold herbals teas and tinctures. I remember going out to my backyard and being able to identify a lot of different “weeds” that were medicinal. I loved your book references for identifying plants in a forest setting! However since I’ve moved to southern Arizona (Sierra vista specifically), I’m having a hard time finding similar books/references for edible weeds/medicinal plants in the area. Do you know of any good ones? Your help is appreciated! Thank you! Love it. Sent to County officials in Oregon trying to force Azure Organic Farm to kill “weeds” with round-up. I saw the Azure situation. It’s a shame that some folks can’t understand the role of weeds as guardians of the soil. Monsanto is a very busy company. I actually search for wild edibles and my wonderful wife got me some stinging nettle seeds last year which are doing fantastic in my garden. Dandelion, wood sorrel, purse lane, all yummy treats and I get almost as excited for them as the plants I planted myself. I found a couple of years ago due to a back injury that not weeding the garden gave me one of the best yields I’ve ever had. Since then I keep them controlled until my planned plants are established and let them go, best decision ever in the garden. One weed I don’t see on people’s lists is bindweed. Is there any reason to let that one grow, because it quickly engulfs the plants it grow next to? In my garden, I had some bindweed growth in compacted areas early on, but now that the soil has improved, I rarely see it. I know that the seeds are around and it can grow, because it does pop up once in a while in compacted pathways, and I had a little in the greenhouse where we’re still working to improve the soil. Good read. I was searching about letting weeds around the plant because i notice my plants the one that has weeds around was the healthiest. no pests problem. I also know the weeds that grow there are mostly nutrient dense and edible. Thank you for this article. Thank you, Rose, for taking time to pay attention to your garden and to share your observations.